The ODS OUTPUT statement writes the table of LS-means to the data set named lsmeans. PROC GLM performs an analysis of covariance and computes LS-means for the variable Drug. The following steps demonstrate how you can create links to connect the results of different analyses. In this example, the table of LS-means is graphically summarized in a horizontal bar chart. 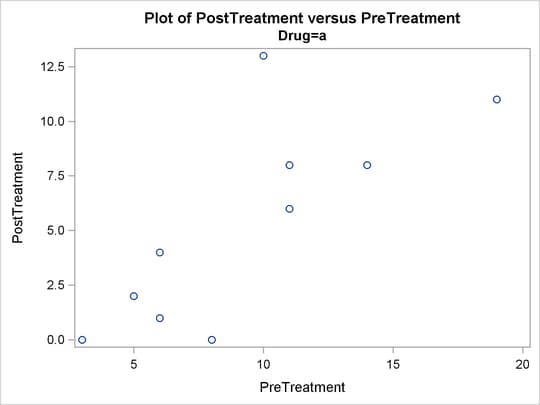 Each bar is linked to a plot that displays the relationship between the PostTreatment response variable and the PreTreatment variable for the drug that corresponds to the bar. NOTE: PROC GLM can use ODS Graphics to create LS-means graphs that are different from the one constructed here. You do not have to run the following steps to get PROC GLM’s standard LS-means plots. The chart is created with the ODS Graphics procedure SGPLOT. For more information about ODS Graphics, see Chapter 21: Statistical Graphics Using ODS. The ODS GRAPHICS statement is not required before you run SG procedures. However, in this case, it is necessary to specify IMAGEMAP=YES so that the URL= option works properly. The size of the graph is also specified with the HEIGHT= and WIDTH= options. 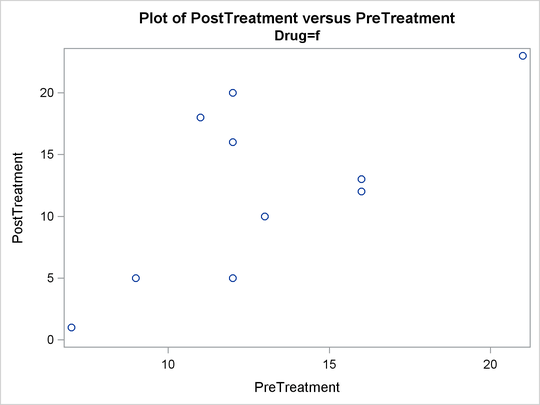 PROC SGPLOT is used, and the HBAR statement requests a horizontal bar chart for the variable Drug. The lengths of the bars represent the values of the LSMean variable. The URL= option specifies the variable DrugClick as the HTML linking variable. The FOOTNOTE statement provides text that indicates how to use the links in the graph. The NEWFILE= option in the ODS HTML statement creates a new HTML file for each page of output. (Page breaks occur only when a procedure explicitly starts a new page.) The NEWFILE= option also increments the filename numeric suffix for each new HTML file created, with the first filename corresponding to that given in the BODY= option, drug1.htm. 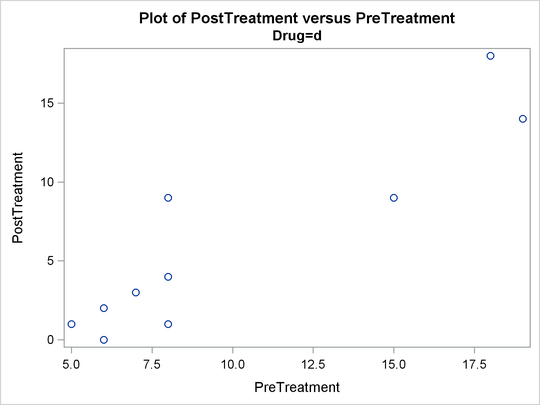 PROC SGPLOT is used, producing a plot of the variable PostTreatment versus the variable PreTreatment for each value of the Drug variable. Three plots are created, and each plot is contained in a separate HTML file. The files are named drug1.htm, drug2.htm, and drug3.htm. The filenames match those filenames specified as values of the DrugClick variable. By default, the HTML files are generated in your current working directory. You can instead specify a path, such as frame=’html/drug2.htm’, to put a file in a subdirectory. The chart in Output 20.9.1 displays the difference in LS-means for each drug type. When you click on a bar that represents a value of the variable Drug, the browser opens the plot of PostTreatment versus PostTreatment variables that corresponds to that value of the variable Drug. Output 20.9.2 displays the plots for each drug type.